When teaching students to compare numbers, you always want to build conceptual understanding first (see prior post). Next, you want to work on procedural fluency. See activities below to help scaffold students doing the math. Concrete – Play a roll and show matching game. Students roll the dice and then build a unifix or snap cube tower of that number. They then match up their towers to compare the amounts. When teaching greater than and less than you want to teach the concept at a concrete, pictorial and then abstract level. Activities to Build Conceptual Understanding. Here is a great Math Template Library! I especially like the “Climb the ladder” template to use as a number of the day organizer. Math mats can be used in several ways. 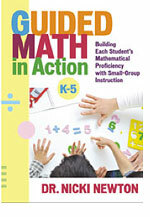 1) The teacher can pull a small guided math group and tell stories using the different word problem types (see p.88/89 http://www.corestandards.org/assets/CCSSI_Math%20Standards.pdf) Remember naming the type is a research based practice! The teacher should have the students work with concrete manipulatives to solve the word problems. 2) The teacher should have the students take turns telling different types of stories and modeling them with manipulatives. 3) The teacher should place the story mats in math centers with differentiated activities attached. Here are some great games for the computer center that help students work on basic operations! A must see and use site! It is a calculation balance game where the students have to balance the math scales. As everyone knows, I am all for bar diagramming as a great thinking tool for solving word problems. Here is a great resource for looking at using bar diagramming with various types of word problems involving addition, subtraction, multiplication, division, fractions, decimals, percents, ratios and algebra. This website -THINKING BLOCKS- has several videos showing bar diagramming in action. PLUS, they provide the actual toolkit to do it on your interactive board or regular computer! WOW…really great stuff! Here is a great site that teaches about protractors and angles! Students get a chance to show, make, measure and estimate angles! Great fun! Be sure to have your students talking about the math as they are working with the game. This math talk is where the learning takes place because as they talk through their work, they are making sense of the math. Here is a great game that can be used in a variety of ways. First, I would use this with a small guided math group so that I could work with students about thinking about the input and output. I would facilitate the discussion as the students took turns operating the machine. Next, I would have students play this game with a partner at the computer center. One partner would do the input and the other would have to explain what happened in the output. Finally, I would have this as an individual center where students played by themselves.